In April 2010 an explosion occurred on the drilling rig Deepwater Horizon about 60 km off the coast of Louisiana in the Gulf of Mexico. The rig burned for about 36 hours then sank to the seafloor, and oil began gushing from the broken riser pipe. This flow continued largely unabated for nearly three months. In terms of its optical properties and the fluid dynamics, this flow was similar in many ways to the hydrothermal vent flows that have been studied for many years. 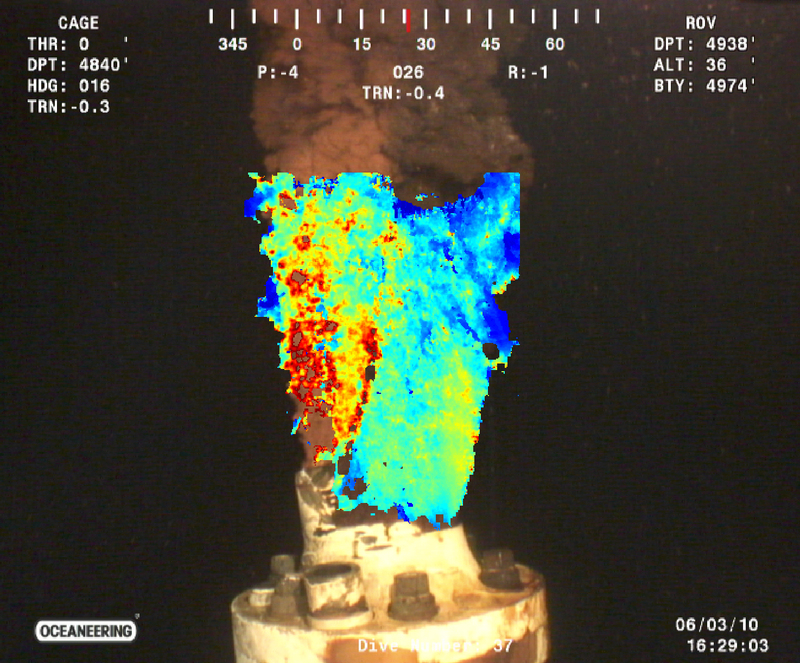 To help scientists understand the ecologial and environmental impacts of this oil release, my coauthor and I applied optical plume velocimetry (OPV) to short video sequences showing flows from the broken and cut riser, in order to estimate the rate that fluids were flowing from the damaged well. The results from our study were published in Science Express on 23 September 2010. The print version was published on 29 October 2010. The print version can be accessed courtesy of Science Magazine without a subscription from my publications page. Below is a supplementary image that might be of interest. Caption: Image of flow from the damaged well on June 3rd 2010 with an overlay of the image velocity field computed using optical plume velocimetry (OPV). Image by Timothy Crone. Images on this page are licensed under a Creative Commons Attribution-NonCommercial 3.0 License. Please attribute these images to Timothy Crone. Last Updated: 25 April 2011.